"When I was informed that I would be reviewing Paradigm's Reference Signature S6 loudspeakers I was extremely excited - these speakers have long been a benchmark of quality in the industry, and in no small way, this is because of how Paradigm designs and manufactures their products." "The boxes and packaging of the speakers were impressive - with every speaker double boxed and protected by a frame of high-density foam underneath a thick plastic seal. 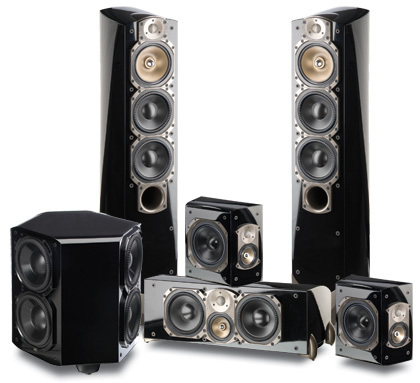 The speakers came out of their boxes looking like works of art - with the cherry finish nothing short of flawless." "I started off by listening to An Organ Blaster from start to finish. Allow me to clarify, I started listening to An Organ Blaster and it sounded so blasted good that I let the entire disc play through...Half a second into the first track I knew I was in for a treat, there was something about the way the Paradigm speakers reproduced the organ that just felt more real." "Exaggeration aside, comparing what I had heard listening to the same music before, I felt as if I was comparing listening in a concert hall to listening inside a closet... Nothing I had heard to that point in my home sounded remotely as good as the Paradigm Signatures, and I could not get enough of them." "Thanks to the SUB 1 suddenly I could enjoy the same assault on my senses in the comfort of my own home! The sealed monster that is the SUB 1 hits harder than any sub I have owned, and it does so with an agility and punch to the sound that is extremely satisfying. While I was quite sure I had heard tight, un-bloated bass before the SUB 1 forced me to reevaluate that opinion as it continued to show up every sub I had heard before in my life. The ADP dipole surrounds did a great job producing the atmospheric elements of the concert including the crowd's cheers and screams, and really made me feel as if I was in the middle of it all." "If I'm not careful in this section I'll go on for a week, so allow me to cut to the chase and give you the facts...It was awesome! While the fidelity and imaging of these speakers is more noticeable when listening to music, it adds realism and immerses you in a way that is hard to describe." "You've already heard me speak to the merits of the SUB 1 so I won't wax poetic about it much longer here save to say that every film I watched on this system made me feel more and more impressed with the SUB 1's performance. With such a great sub anchoring the sound, the mains themselves sounded better...The mains did an awesome job of throwing a massive wall of sound my way and repeatedly impressed me." "While my surrounds produced atmospherics quite well, the ADP surrounds were in another league entirely. Whether it was wind whistling past or the thrum of warp engines, suddenly surround content had far more weight and realism to it." "Paradigm's generous review loan has answered a longstanding set of questions for me. What does seventeen grand sound like? If you asked me that question prior to the arrival of Paradigm's S6 based review system, I would have probably said a waste of money. After several weeks of painstaking tweaking, listening, agonizing and enjoyment I started to find myself understanding the question a bit better. What value did I place on hearing things I had never heard before in my tired old recordings? How much was it worth to have friends come over and spend two hours with a massive grin on their faces as the Paradigm's did their job with whatever film we had chosen? Finally, what was it worth to have my wife repeatedly ask me to turn it up instead of down? Am I willing to spend that kind of money on audio gear? After hearing these speakers, the answer is a simple and emphatic, YES!" We covered the highlights but the review is very thorough. Click here! to read Dave Upton's full review.